For other uses, see Margaret Tudor (disambiguation). 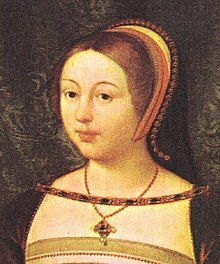 Margaret Tudor (28 November 1489 – 18 October 1541) was Queen of Scots from 1503 until 1513 by marriage to James IV of Scotland and then, after her husband died fighting the English, she became regent for their son James V of Scotland from 1513 until 1515. She was born at Westminster Palace as the eldest daughter of King Henry VII of England and Elizabeth of York, and granddaughter of Margaret Beaufort, Edward IV of England and Queen Elizabeth Woodville. Margaret Tudor had several pregnancies, but most of her children died young or were stillborn. As queen dowager she married Archibald Douglas, 6th Earl of Angus. Through her first and second marriages, respectively, Margaret was the grandmother of both Mary, Queen of Scots, and Mary's second husband, Lord Darnley. 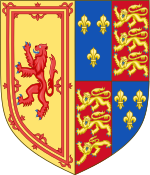 Margaret's marriage in 1503 to James IV linked the royal houses of England and Scotland, which a century later resulted in the Union of the Crowns. Upon his ascent to the English throne, Margaret's great-grandson, James VI and I, was the first person to be monarch of both Scotland and England. Margaret was baptised in St. Margaret's Church, Westminster. She was named after Margaret Beaufort, Countess of Richmond and Derby, her paternal grandmother. Daughters were important political assets in a world where diplomacy and marriage were closely linked. Even before Margaret's sixth birthday, Henry VII thought about a marriage between Margaret and James IV as a way of ending the Scottish king's support for Perkin Warbeck, pretender to the throne of England. It is also highly likely that Henry may have believed that such a marriage alliance would be a step towards uniting the English and Scottish thrones, something that his son, the future Henry VIII would also attempt during his reign. What then? Should anything of the kind happen (and God avert the omen), I foresee that our realm would suffer no harm, since England would not be absorbed by Scotland, but rather Scotland by England, being the noblest head of the entire island, since there is always less glory and honour in being joined to that which is far the greater, just as Normandy once came under the rule and power of our ancestors the English. On 24 January 1502, Scotland and England concluded the Treaty of Perpetual Peace, the first peace agreement between the two realms in over 170 years. The marriage treaty was concluded the same day and was viewed as a guarantee of the new peace. The marriage was completed by proxy on 25 January 1503 at Richmond Palace. Patrick, Earl of Bothwell, was proxy for the Scottish King and wore a gown of cloth-of-gold at the ceremony in the Queen's great chamber. He was accompanied by the Archbishop of Glasgow and Andrew Forman, Postulate of Moray. The herald, John Young, reported that "right notable jousts" followed the ceremony. Prizes were awarded the next morning and the tournament continued another day. Margaret was now regarded as Queen of Scots. The new queen was provided with a large wardrobe of clothes, and her crimson state bed curtains made of Italian sarcenet were embroidered with red Lancastrian roses. Clothes were also made for her companion, Lady Catherine Gordon, the widow of Perkin Warbeck. In May 1503, James IV confirmed her possession of lands and houses in Scotland, including Methven Castle, Stirling Castle, Doune Castle, Linlithgow Palace and Newark Castle in Ettrick Forest, with the incomes from the corresponding Earldom and Lordship lands. Later in 1503, Margaret came to Scotland; her progress was a grand journey northward. She left Richmond Palace on 27 June with Henry VII and they travelled first to Collyweston. At York a plaque commemorates the exact spot where the Queen of Scots entered its gates. After crossing the border at Berwick upon Tweed on 1 August 1503, Margaret was met by the Scottish court at Lamberton. At Dalkeith Palace, James came to kiss her goodnight. He came again to console her on 4 August after a stable fire had killed some of her favourite horses. Her riding gear, including a new sumpter cloth or pallion of cloth-of-gold worth £127  was destroyed in the fire. On the 7 August 1503, Margaret was carried from Dalkeith to Edinburgh on a litter. At a meadow a mile from Edinburgh, there was a pavilion where Sir Patrick Hamilton and Patrick Sinclair played and fought in the guise of knights defending their ladies. On 8 August 1503, the marriage was celebrated in person in Holyrood Abbey. The rites were performed by the Archbishop of Glasgow and the Archbishop of York. Two days later, on St Lawrence's day, Margaret went to mass at St Giles', the town's Kirk, as her first public appointment. The details of the proxy marriage, progress, arrival, and reception in Edinburgh were recorded by the Somerset Herald, John Young. 'merle'= blackbird; 'scho'= she; 'quhyt'= white; 'suffragane'= representative. Gladethe, thoue queyne of Scottis regioun. 'Gladethe'= Rejoice! 'na'= than; 'beriale'= beryl; 'eik'= also; 'of the I meyne'= thee I mean: I speak of you. Welcum of Scotlond to be quene! James, Duke of Rothesay (21 February 1507, Holyrood Palace – 27 February 1508, Stirling Castle). Daughter (died shortly after birth 15 July 1508, Holyrood Palace). Arthur Stewart, Duke of Rothesay (20 October 1509, Holyrood Palace – 14 July 1510, Edinburgh Castle). James V (10 April 1512, Linlithgow Palace – 14 December 1542, Falkland Palace). Daughter (died shortly after birth November 1512, Holyrood Palace). Alexander Stewart, Duke of Ross (30 April 1514, Stirling Castle – 18 December 1515, Stirling Castle). The king named the Scottish warship Margaret after her. Margaret, thought to have been drawn from life. The treaty of 1502, far from being perpetual, barely survived the death of Henry VII in 1509. His successor, the young Henry VIII, had little time for his father's cautious diplomacy, and was soon heading towards a war with France, Scotland's historic ally. In 1513, James invaded England to honour his commitment to the Auld Alliance, only to meet death and disaster at the Battle of Flodden. Margaret had opposed the war, but was still named in the royal will as regent for the infant king, James V, for as long as she remained a widow. Parliament met at Stirling not long after Flodden, and confirmed Margaret in the office of regent. A woman was rarely welcome in a position of supreme power, and Margaret was the sister of an enemy king, which served to compound her problems. Before long a pro-French party took shape among the nobility, urging that she should be replaced by John Stewart, 2nd Duke of Albany, the closest male relative to the infant prince, and now third in line to the throne. Albany, who had been born and raised in France, was seen as a living representative of the Auld Alliance, in contrast with the pro-English Margaret. She is considered to have acted calmly and with some degree of political skill. By July 1514, she had managed to reconcile the contending parties, and Scotland — along with France — concluded peace with England that same month. But in her search for political allies amongst the fractious Scottish nobility she took a fatal step, allowing good sense and prudence to be overruled by emotion and the personal magnetism of Archibald Douglas, 6th Earl of Angus. In seeking allies Margaret turned more and more to the powerful House of Douglas. She found herself particularly attracted to Archibald Douglas, 6th Earl of Angus, whom even his uncle, the cleric and poet Gavin Douglas, called a "young witless fool". Margaret and Douglas were secretly married in the parish church of Kinnoull, near Perth, on 6 August 1514. Not only did this alienate the other noble houses but it immediately strengthened the pro-French faction on the council, headed by James Beaton, Archbishop of Glasgow. By the terms of the late king's will she had sacrificed her position; before the month was out she was obliged to consent to the appointment of Albany. In September the Privy Council decided that she had also forfeited her rights to the supervision of her sons, whereupon in defiance she and her allies took the princes to Stirling Castle. Albany arrived in Scotland in May 1515, and was finally installed as regent in July. His first task was to get custody of James and Alexander, politically essential for the authority of the regency. Margaret, after some initial defiance, surrendered at Stirling in August. With the princes in the hands of their uncle, Margaret, now expecting a child by Angus, retired to Edinburgh. For some time her brother had been urging her to flee to England with her sons; but she had steadily refused to do so, fearing such a step might lead to James's loss of the Scottish crown. However, once Margaret's two sons were in the custody of their uncle, Margaret secretly accepted her brother's offer of her personal safety at the English Court. Pregnant with Angus' child, Margaret feared for her life under the rule of the Privy Council of Scotland. As Dowager Queen she was forced to beg permission from the Privy Council even to travel. Eventually, she obtained permission to go to Linlithgow, Scotland, whence she escaped to the border and thence to England. She was received by Lord Dacre, Henry's Warden of the Marches, and taken to Harbottle Castle in Northumberland. Here in early October she gave birth to Lady Margaret Douglas, the future Countess of Lennox and mother of Henry Stuart, Lord Darnley, cousin and second husband to Mary, Queen of Scots. While still in the north of England, Queen Margaret learned of the death of her younger son, Alexander. Dacre hinted that Albany — cast in the role of Richard III — was responsible. Margaret, even in her vulnerable state, refused to accept this, saying that if he really aimed at securing the throne for himself the death of James would have suited his purpose better. It was also at this time that she at last began to get the measure of Angus, who, with an eye on his own welfare, returned to Scotland to make peace with the Regent, "which much made Margaret to muse". When Henry learned that Angus would not be accompanying his sister to London he said, "Done like a Scot". However, all of Angus's power, wealth and influence was in Scotland; to abandon the country would mean possible forfeiture for treason. In this regard he would have had before him the example of his kinsman James Douglas, 9th Earl of Douglas, who fled to England the previous century, living out his life as a landless mercenary. Margaret was well received by Henry and, to confirm her status, was lodged in Scotland Yard, the ancient London residence of the Scottish kings. In 1517, having spent a year in England, she returned north, after a treaty of reconciliation had been worked out by Albany, Henry and Cardinal Wolsey. Albany was temporarily absent in France — where he renewed the Auld Alliance once more and arranged for the future marriage of James V — but the Queen-Dowager was received at the border by Sieur de la Bastie, his deputy, as well as by her husband. Peace may have broken out but it was perfectly clear that Margaret was still not fully trusted, and access to her son was strictly limited. "I am sore troubled with my Lord of Angus since my last coming into Scotland, and every day more and more, so that we have not been together this half year… I am so minded that, an I may by law of God and to my honour, to part with him, for I wit well he loves me not, as he shows me daily." This was a difficult issue for Henry; a man of conservative and orthodox belief, he was opposed to divorce on principle – which was highly ironic, considering his later marital career. Just as important, Angus was a useful ally and an effective counter-weight to Albany and the pro-French faction. Angered by his attitude, Margaret drew closer to the Albany faction and joined others in calling for his return from France. Albany, seemingly in no hurry to return to the fractious northern kingdom, suggested that she resume the regency herself. The dispute between husband and wife was set to dominate Scottish politics for the next three years, complicated even more by a bitter feud between Angus and James Hamilton, 1st Earl of Arran; with bewildering rapidity Margaret sided with one and then the other. Albany finally arrived back in Scotland in November 1521 and was warmly received by Margaret. It was soon rumoured that their cordial relations embraced more than politics. Angus went into exile while the Regent — with the full cooperation of the Queen-Dowager — set about restoring order to a country riven by three years of intense factional conflict. Albany was useful to Margaret: he was known to have influence in Rome, which would help ease her application for a divorce. Angus and his allies spread the rumour that the two were lovers, to such effect that even the sober-headed Lord Dacre wrote to Wolsey, predicting that James would be murdered and Albany would become king and marry Margaret. But the relationship between the two was never more than one of calculated self-interest, as events were soon to prove. Painting of Margaret, refusing to hand over custody of her sons to John Stewart, Duke of Albany, by John Faed, 1859. In most essentials Margaret remained an Englishwoman in attitude and outlook, and at root she genuinely desired a better understanding between the land of her birth and her adopted home. Necessity demanded an alliance with Albany and the French faction, especially after the devastating border wars with England in the early 1520s. But no sooner was Albany off the scene than she set about organising a party of her own. In 1524, the Regent was finally removed from power in a simple but effective coup d'état. With Albany once more in France (where he was to die in 1536), Margaret, with the help of Arran and the Hamiltons, brought James, now twelve years old, from Stirling to Edinburgh. It was a bold and popular move. In August Parliament declared the regency at an end, as James was elevated to full kingly powers. In practice, he would continue to be governed by others, his mother above all. When Beaton objected to the new arrangements Margaret had him arrested and thrown into jail. In November Parliament formally recognised Margaret as the chief councillor to the King. Margaret's alliance with Arran inevitably alienated other noble houses. Her situation was not eased when her brother allowed Angus to return to Scotland. Both of these factors were to some degree beyond her control. The most damaging move of all was not. She formed a new attachment, this time to Henry Stewart, a younger brother of Lord Avondale. Stewart was promoted to senior office, angering the Earl of Lennox, among others, who promptly entered into an alliance with her estranged husband. That same November, when Parliament confirmed Margaret's political office, her war with Angus descended into a murderous farce. When he arrived in Edinburgh with a large group of armed men, claiming his right to attend Parliament, she ordered cannons to be fired on him from both the Castle and Holyrood House. When the two English ambassadors present at court, Thomas Magnus and Roger Radclyff, objected that she should not attack her lawful husband she responded in anger, telling them to "go home and not meddle with Scottish matters". Angus withdrew for the time being, but under pressure from various sources the Queen finally admitted him to the council of regency in February 1525. It was all the leverage he needed. Taking custody of James he refused to give him up, exercising full power on his behalf for a period of three years. James' experience during this time left him with an abiding hatred of both the house of Douglas and the English connection. Margaret attempted to resist but was forced to bend to the new political realities. Besides, by this time her desire for a divorce had become obsessive, taking precedence over all other matters. She was prepared to use all arguments, including the widespread myth that James IV had not been killed at Flodden. Despite the coup of 1524 she corresponded warmly with Albany, who continued his efforts on her behalf in Rome. In March 1527, Pope Clement VII granted her petition. Because of the political situation in Europe at the time it was not until December that she learned of her good fortune. She married Henry Stewart on 3 March 1528, ignoring the pious warnings of her brother that marriage was "divinely ordained" and his protests against the "shameless sentence sent from Rome". Not many years later, Henry himself would break with Rome precisely because he could not get the same 'shameless sentence'. In June 1528, James V finally freed himself from the tutelage of Angus – who once more fled into exile – and began to rule in his own right. Margaret was an early beneficiary of the royal coup, she and her husband emerging as the leading advisors to the king. James created Stewart Lord Methven "for the great love he bore to his dearest mother". It was rumoured – falsely – that the Queen favoured a marriage between her son and her niece Mary, but she was instrumental in bringing about the Anglo-Scottish peace agreement of May 1534. The central aim of Margaret's political life – besides assuring her own survival – was to bring about a better understanding between England and Scotland, a position she held to through some difficult times. James was suspicious of Henry, especially because of his continuing support for Angus, a man he loathed with a passion. Even so, in early 1536 his mother persuaded him to meet with her brother. It was her moment of triumph and she wrote to Henry and Thomas Cromwell, now his chief advisor, saying that it was "by advice of us and no other living person". She was looking for a grand occasion on the lines of the Field of Cloth of Gold, and spent a huge sum in preparation. In the end it came to nothing because there were too many voices raised in objection and because James would not be managed by his mother or anyone else. In a private interview with the English ambassador, William Howard, her disappointment was obvious – "I am weary of Scotland", she confessed. Her weariness even extended to betraying state secrets to Henry. Weary of Scotland she may have been: she was now even more tired of Lord Methven, who was proving himself to be even worse than Angus in his desire both for other women and for his wife's money. She was once again eager for divorce but proceedings were frustrated by James, who she believed her husband had bribed. As so often in Margaret's life, tragedy and unhappiness were closely pursued by intrigue and farce. At one point she ran away toward the border, only to be intercepted and brought back to Edinburgh. Time and again she wrote to Henry with complaints about her poverty and appeals for money and protection – she wished for ease and comfort instead of being obliged "to follow her son about like a poor gentlewoman". In June 1538, Margaret welcomed Mary of Guise, James's new French bride to Scotland. These two women, among the most formidable in Scottish history, established a good understanding. Mary made sure that her mother-in-law, who had now been reconciled with Methven, made regular appearances at court and it was reported to Henry that "the young queen was all papist, and the old queen not much less." 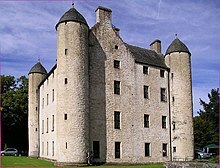 Margaret died at Methven Castle, in Perthshire on 18 October 1541. Henry Ray, the Berwick Pursuivant, reported that she had a palsy on Friday and died on the following Tuesday. As she thought she would recover she did not trouble to make a will. She sent for King James, who was at Falkland Palace, but he did not come in time. Near the end she wished that the friars who attended her would seek the reconciliation of the King and the Earl of Angus. She hoped the King would give her possessions to her daughter, Lady Margaret Douglas. James arrived after her death, and he ordered Oliver Sinclair and John Tennent to pack up her belongings for his use. She was buried at the Carthusian Charterhouse in Perth (demolished during the Reformation, 1559). The Tudor dynasty ended with the childless Elizabeth I, and the line of succession to the English throne was passed through Margaret's heirs. Her great-grandson, James VI of Scotland, became James I of England, thus uniting the crowns of the two kingdoms and conferring on Margaret something of a posthumous triumph. Detail of Margaret and Henry VIII being visited by Erasmus, dated c. 1910, by Frank Cadogan Cowper. A depiction of Margaret from a family tree from the reign of her great-grandson, James VI/I of Scotland and England. Margaret Tudor, dated c. 1620-1638, by Daniel Mytens. Margaret Tudor praying in coronation robes, 16th century, probably by Gerard Horenbout. ^ Marshall, Rosalind Kay (2003). Scottish Queens, 1034–1714. Tuckwell. ISBN 978-1-86232-271-4. ^ a b Ashley, Mike (1999). The mammoth book of British kings and queens. London: Robinson Publishers. p. 567. ISBN 1-84119-096-9. ^ Bain (1888, pp. 342–345), nos. 1707–1718. ^ Accounts of the Lord High Treasurer, vol. 2 (1900), 214–215. ^ Tasioulas (1999, p. 277), stanza 25. ^ Tasioulas (1999, p. 280), stanza 5. ^ Tasioulas (1999, p. 269), stanza 3. ^ Porter, Linda (1 July 2014). Tudors Versus Stewarts: The Fatal Inheritance of Mary, Queen of Scots. St. Martin's Press. pp. 219–. ISBN 978-1-4668-4272-4. ^ Stone, Jean Mary (1905). Studies from Court and Cloister: Being Essays, Historical and Literary, Dealing Mainly with Subjects Relating to the XVIth and XVIIth Centuries. Sands. pp. 29–. ^ Leslie Carroll (2 September 2014). Inglorious Royal Marriages: A Demi-Millennium of Unholy Mismatrimony. Penguin Publishing Group. pp. 45–. ISBN 978-1-101-59836-8. ^ Wood, Mar. Anne Everett, ed. (1846). Letters of royal, and illustrious ladies of Great Britain, from the commencement of the twelfeth century to the close of the reign of queen Mary. Henr. Colburn. pp. 134–. ^ State Papers: King Henry the Eighth; Part IV. – continued. Murray. 1836. p. 48. ^ State Papers Henry VIII, vol. 5 part 2 cont., (1836), 193–4, Ray to Privy Council. Bain, Joseph, ed. (1888). Calendar of Documents Relating to Scotland, Vol. 4: Preserved in Her Majesty's Public Record Office, London; A. D. 1357–1509. HM Register House. pp. 419–425. Buchanan, Patricia Hill (1 November 1985). Margaret Tudor, Queen of Scots. Scottish Academic Press. Leland, John (1770). Joannis Lelandi Antiquarii de Rebus Britannicis Collectanea. Impensis Gul. & Jo. Richardson. pp. 258–300. Perry, Maria (2000). The Sisters of Henry VIII: The Tumultuous Lives of Margaret of Scotland and Mary of France. Perseus Books Group. ISBN 978-0-306-80989-7. Strickland, Agnes (1855). Lives of the queens of Scotland and English princesses connected with the regal succession of Great Britain. Harper & brothers. pp. 151–. Tasioulas, Jacqueline (1 July 2010). The Makars. Canongate Books. pp. 4–. ISBN 978-1-84767-501-9. Chapman, Hester (1969). The Thistle and the Rose: The Sisters of Henry VIII. Coward, McCann & Geoghegan, Incorporated. Fradenburg, Louise O., "Troubled Times: Margaret Tudor and the Historians", in Sally Mapstone; Juliette Wood (1 January 1998). The Rose and the Thistle: Essays on the Culture of Late Medieval and Renaissance Scotland. Tuckwell. ISBN 978-1-898410-57-7. Glenne, Michael (1952). King Harry's sister, Margaret Tudor, Queen of Scotland. J. Long. Harvey, Nancy Lenz (1975). The rose and the thorn: the lives of Mary and Margaret Tudor. Macmillan. ISBN 978-0-02-548550-1. Jansen, S. (17 October 2002). The Monstrous Regiment of Women: Female Rulers in Early Modern Europe. Palgrave Macmillan US. ISBN 978-0-230-60211-3. Mackie, J. D. (1994). The Earlier Tudors: 1485 – 1558. ISBN 0-19-285292-2. Nairne, Charles Richard Routh; Peter Holmes (2001). Who's who in Tudor England. Stackpole Books. ISBN 978-0-8117-1639-0. Plowden, Alison (31 July 2011). Tudor Women: Queens & Commoners. History Press. ISBN 978-0-7524-6716-0. Simpson, Grant G.; James D. Galbraith. Calendar of Documents Relating to Scotland: 1357-1509, addenda 1221-1435. H.M. General Register House. Wikimedia Commons has media related to Margaret Tudor. "Margaret, Queen of Scotland" . Encyclopædia Britannica. 17 (11th ed.). 1911. p. 701. James V was King of Scotland from 9 September 1513 until his death, which followed the Scottish defeat at the Battle of Solway Moss. His only surviving legitimate child, Mary, Queen of Scots, succeeded him when she was just six days old. James IV was the King of Scotland from 11 June 1488 to his death. He assumed the throne following the death of his father, King James III, at the Battle of Sauchieburn, a rebellion in which the younger James played an indirect role. He is generally regarded as the most successful of the Stewart monarchs of Scotland, but his reign ended in a disastrous defeat at the Battle of Flodden. He was the last monarch from the island of Great Britain to be killed in battle. Henry Stuart, Duke of Albany, styled as Lord Darnley until 1565, was king consort of Scotland from 1565 until his murder at Kirk o' Field in 1567. 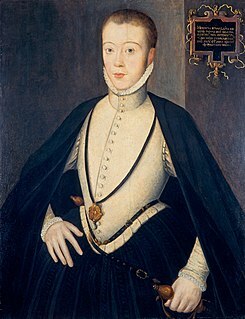 Many contemporary narratives describing his life and death refer to him as Lord Darnley, his title as heir apparent to the Earldom of Lennox, and it is by this appellation that he is now generally known. Holyrood Abbey is a ruined abbey of the Canons Regular in Edinburgh, Scotland. The abbey was founded in 1128 by King David I. During the 15th century, the abbey guesthouse was developed into a royal residence, and after the Scottish Reformation the Palace of Holyroodhouse was expanded further. The abbey church was used as a parish church until the 17th century, and has been ruined since the 18th century. The remaining walls of the abbey lie adjacent to the palace, at the eastern end of Edinburgh's Royal Mile. The site of the abbey is protected as a scheduled monument. James III was King of Scots from 1460 to 1488. James was an unpopular and ineffective monarch owing to an unwillingness to administer justice fairly, a policy of pursuing alliance with the Kingdom of England, and a disastrous relationship with nearly all his extended family. However, it was through his marriage to Margaret of Denmark that the Orkney and Shetland islands became Scottish. Margaret of Denmark, also referred to as Margaret of Norway, was Queen of Scotland from 1469 to 1486 by marriage to King James III. She was the daughter of Christian I, King of Denmark, Norway and Sweden, and Dorothea of Brandenburg. Margaret Douglas, Countess of Lennox, was the daughter of the Scottish queen dowager Margaret Tudor and her second husband Archibald Douglas, 6th Earl of Angus. In her youth she was high in the favour of her uncle, Henry VIII of England, but twice incurred the King's anger, first for her unauthorised engagement to Lord Thomas Howard, who died in the Tower of London in 1537 because of his misalliance with her, and again in 1540 for an affair with Thomas Howard's nephew Sir Charles Howard, the brother of Henry's wife Catherine Howard. On 6 July 1544, she married Matthew Stewart, 4th Earl of Lennox, one of Scotland's leading noblemen. Her son Henry Stuart, Lord Darnley, married Mary, Queen of Scots, and was the father of James VI and I.
Gavin Douglas was a Scottish bishop, makar and translator. Although he had an important political career, he is chiefly remembered for his poetry. His main pioneering achievement was the Eneados, a full and faithful vernacular translation of the Aeneid of Virgil into Scots, and the first successful example of its kind in any Anglic language. Other extant poetry of his includes Palice of Honour, and possibly King Hart. James Douglas, 4th Earl of Morton was the last of the four regents of Scotland during the minority of King James VI. He was in some ways the most successful of the four, since he won the civil war that had been dragging on with the supporters of the exiled Mary, Queen of Scots. However, he came to an unfortunate end, executed by means of the Maiden, a predecessor of the guillotine, which he himself was said to have introduced to Scotland. Matthew Stewart, 4th Earl of Lennox, was the fourth Earl of Lennox, and a leader of the Catholic nobility in Scotland. He was the son of John Stewart, 3rd Earl of Lennox and Lady Elizabeth Stewart, daughter of John Stewart, 1st Earl of Atholl. His grandson was King James VI of Scotland and I of England. Murdoch Stewart, Duke of Albany was a leading Scottish nobleman, the son of Robert Stewart, Duke of Albany and the grandson of King Robert II of Scotland, who founded the Stewart dynasty. In 1389, he became Justiciar North of the Forth. In 1402, he was captured at the Battle of Homildon Hill and would spend 12 years in captivity in England. Archibald Douglas, 6th Earl of Angus was a Scottish nobleman active during the reigns of James V and Mary, Queen of Scots. He was the son of George, Master of Angus, who was killed at the Battle of Flodden, and succeeded as Earl of Angus on the death of his grandfather, Archibald. James Hamilton, 1st Earl of Arran and 2nd Lord Hamilton was a Scottish nobleman, naval commander and first cousin of James IV of Scotland. John Stewart, Duke of Albany was regent of the Kingdom of Scotland, Duke of Albany in peerage of Scotland and Count of Auvergne and Lauraguais in France.